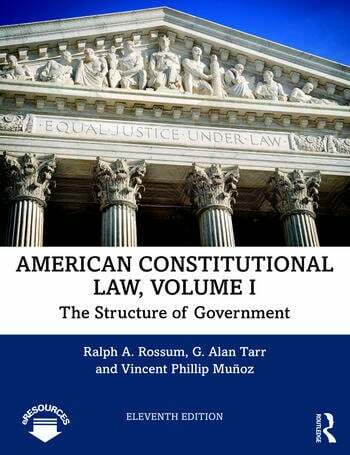 American Constitutional Law 11e, Volume I provides a comprehensive account of the nation's defining document, examining how its provisions were originally understood by those who drafted and ratified it, and how they have since been interpreted by the Supreme Court, Congress, the President, lower federal courts, and state judiciaries. Clear and accessible chapter introductions and a careful balance between classic and recent cases provide students with a sense of how the law has been understood and construed over the years. The 11th Edition has been fully revised to include several new cases, including Trump v. Hawaii (2018), in which Chief Justice Roberts held that Korematsu v. United States “has been been overruled in the court of history”; Murphy v. National Collegiate Athletic Association (2018), in which Justice Alito’s majority opinion provides the most compelling argument to date against federal commandeering of state officials; and Sveen v. Melin (2018), a Contract Clause case that shows the Court’s continuing refusal to give a textualist reading of that provision, even in the face of Justice Gorsuch’s compelling and amusing dissent. A revamped and expanded companion website offers access to even more additional cases, an archive of primary documents, and links to online resources, making this text essential for any constitutional law course. Punitive Damages: An Exception to the Demise of Substantive Due Process in the Economic Realm? Ralph A. Rossum is Henry Salvatori Professor of American Constitutionalism at Claremont McKenna College. He earned his PhD from the University of Chicago and is the author of several books, including The Supreme Court and Tribal Gaming: California v. Cabazon Band of Mission Indians (2011); Antonin Scalia’s Jurisprudence: Text and Tradition (2006); Federalism, the Supreme Court, and the Seventeenth Amendment: The Irony of Constitutional Democracy (2001); Congressional Control of the Judiciary: The Article III Option (1988); The American Founding: Politics, Statesmanship, and the Constitution (1981); Reverse Discrimination: The Constitutional Debate (1979); and The Politics of the Criminal Justice System: An Organizational Analysis (1978). He has served in the US Department of Justice as deputy director of its Bureau of Justice Statistics and as a board member of its National Institute of Corrections. He currently serves as a member of the California Advisory Committee, US Commission on Civil Rights. G. Alan Tarr is Board of Governors Professor Emeritus and the founder and former Director of the Center for State Constitutional Studies at Rutgers University in Camden, New Jersey. He received his doctorate from the University of Chicago. Professor Tarr is the author of several books, including Judicial Process and Judicial Policymaking (6th edition, 2013), Without Fear or Favor: Judicial Independence and Judicial Accountability in the States (2012), Understanding State Constitutions (1998), and State Supreme Courts in State and Nation (1988). He is coeditor of the three-volume State Constitutions for the Twenty-First Century (2005), Constitutional Dynamics in Federal Systems: Subnational Perspectives (2012), Constitutional Origins, Structure, and Change in Federal Countries (2005), and several other volumes. Three times the recipient of fellowships from the National Endowment for the Humanities and more recently a Fulbright Fellow, Professor Tarr has served as a consultant to the US Department of State, the American Bar Association, the National Center for State Courts, and several state governments. He has lectured on American constitutionalism and federalism throughout the United States, as well as in Africa, Asia, Europe, North America, and South America. Vincent Phillip Muñoz is Tocqueville Associate Professor of Political Science and Director of the Program of Constitutional Studies at the University of Notre Dame. He received his BA from Claremont McKenna College, MA from Boston College, and Ph.D. from The Claremont Graduate School. Professor Muñoz is author of God and the Founders: Madison, Washington, and Jefferson (2009) and editor of Religious Liberty and the American Supreme Court: The Essential Cases and Documents (revised edition, 2015).